You may not realize it but China faces a greater crisis of an aging population than nearly any other nation on earth. The one-child policy of China has meant that as seniors age out of the workforce, there are fewer younger people to enter fill in the gaps, or help care for this burgeoning senior population. And with the shifting of agrarian populations into cities, the dislocation and isolation of millions of seniors in China is becoming a national crisis. How is China coping? 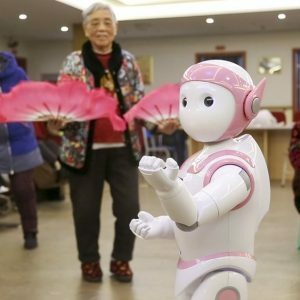 One emerging idea is to put artificial intelligence, in the guise of robot helpers and companions, to assist in senior care facilities. As part of its new series on “Machines With Brains,” the publication Quartz has a new video out to give you a glance at these new Chinese robot helpers. Is it creepy or captivating? Find out by watching Here.